On March 3, 2015, in celebration of International Women’s Day, SikhNet will release an original short animation called KAUR. KAUR weaves together two different story arcs. One – about a young modern-day girl named Saibhang Kaur who struggles with pursuing her dreams. The other – about the historical Sikh figure, Mai Bhago. In the animation, Saibhang Kaur’s grandmother tells her the story of Mai Bhago and the Forty Liberated Ones. However, the history of Mai Bhago told in the animation is not exactly the story many Sikhs are familiar with. This article will help explain why the story in KAUR is a little different, along with the process the SikhNet creative team went through in arriving at this particular version. During the siege of Anandpur Sahib, 40 men decided to desert Guru Gobind Singh. They signed a letter of renunciation, left the fort, and arrived back home in Jhabal, outside of Amritsar. One of the deserters, Nidhan Singh Patti, was married to Bhago Kaur. When Bhago Kaur heard her husband had renounced Guru Gobind Singh, she became furious. She rallied her husband and the other deserters. They rode to Khidrana, (which is now known as Sri Mukatsar Sahib), and fought a battle against the Mughals. Every Sikh in the battle died except Mai Bhago. Guru Gobind Singh, at the dying request of Mahan Singh, tore up the note of renunciation and the 40 became liberated. 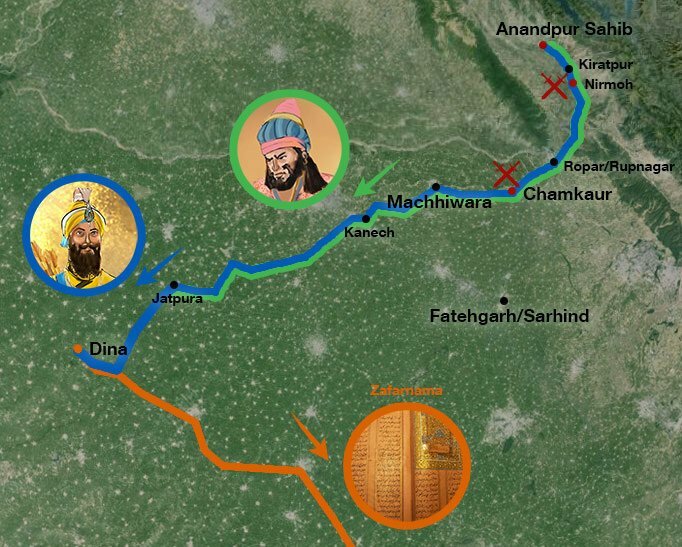 As we worked on the script, being a stickler for details, I wanted to actually chart on a map the journey that the 40 took and the journey Guru Gobind Singh took after the fall of Anandpur Sahib, to see how the story worked from a logistical standpoint. The more we charted the history, the less the story made sense. Jhabal is approximately 123 miles (or 198 km) northwest of Anandpur Sahib. Khidrana (Sri Mukatsar Sahib) is approximately 101 miles (or 164 km) south of Jhabal. Khidrana (Sri Mukatsar Sahib) is approximately 160 miles (or 257 km) kilometers southwest of Anandpur Sahib. 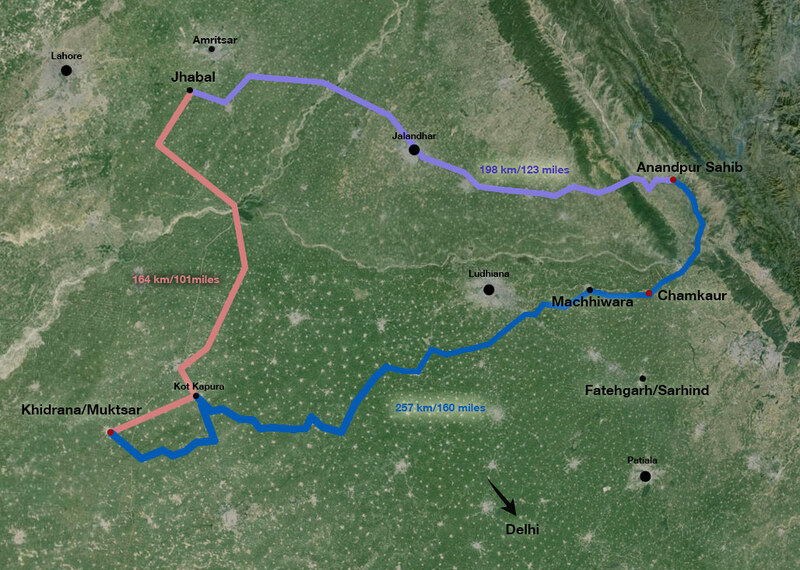 For the 40 to travel from Anandpur Sahib to Jhabal and then head, after a brief rest, towards Khidrana, would have taken perhaps a couple weeks – if they traveled an average of 25 miles/40 km a day. 25 miles a day is an average pace for a horse. It is also an 8-hour walking day if someone averages 3 miles an hour. With this rudimentary math, we can say that the story of the 40 as we know it implies perhaps a two-three week lapse between the time the 40 left Anandpur Sahib and when they arrived, under Mai Bhago’s leadership, at Khidrana. However, this timing does not work if you look at what happened to Guru Gobind Singh ji after the fall of Anandpur Sahib. Sometimes, we do not realize what an incredible odyssey Guru Gobind Singh embarked upon after the fall of Anandpur Sahib. The Mughal army, tens, if not hundreds of thousands, enacted a cat and mouse hunt with the Guru, trying to destroy him once and for all. You can see from the map below how many stops the Guru made along the way to Khidrana (Mukatsar). Incredibly significant events happen in these places. Events that define Sikh history, and would have taken much longer than a few weeks to unfold. Here are just some highlights of what happened to Guru Gobind Singh as he eludes the Mughal army. As you read through these stories, imagine how much time it would have taken for these events to unfold. And how unlikely that Guru Gobind Singh could have arrived in Khidrana in two or three weeks. The Mughal army pursues Guru Gobind Singh to Nirmoh and there is a battle there. At Ropar, Guru Gobind Singh meets up with his mother and two youngest sons. He wants them to find a safe haven. A former cook of the Guru’s, Gangu, offers to take his mother and two sons to his home in Sarhind. They spend the night in Ropar. 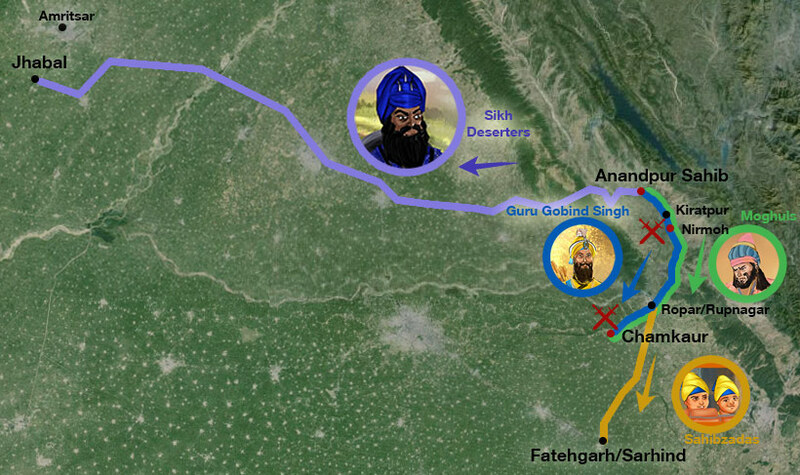 Then Mata Gujri, Baba Zorawar Singh and Baba Fateh Singh proceed to Sarhind. At Chamkaur. a fierce battle unfolds. Guru Gobind Singh and 40 Sikhs turn the house of a Jat farmer into a mini-fort. At least tens of thousands of soldiers attempt to annihilate them. According to Guruji’s Zafarnama, the Mughal forces are a million strong. The Sikhs engage the enemy six at a time and create tremendous destruction before they die. The Guru’s oldest sons, Baba Ajit Singh and Baba Jujhar Singh, fight valiantly but fall in battle. Two Sikhs – Bhai Sant Singh and Bhai Sangat Singh – stay in the fort at Chamkur. Bhai Sant Singh wears the Guru’s armor and plume. The two hold off the enemy as long as possible, and deceive them about the identity of the true Guru. The other three Sikhs, Bhai Daya Singh, Bhai Dharam Singh and Bhai Man Singh, leave with the Guru. All four scatter in different directions. They agree to meet again according to a particular star. Machhiwara Forest. Guru Gobind Singh walks barefoot through the Machhiwara forest, damaging his feet in the process. During this period of absolute isolation, Guru Gobind Singh composes the shabad, Mittar Pyare Nu. (http://www.sikhiwiki.org/index.php/Mittar_Pyare_Nu). Eventually, the three Sikhs who left Chamkur with him find the Guru in the forest, sleeping with a water-pot for a pillow. The Guru says he cannot go any further because his feet are badly wounded, and that they should save themselves. Bhai Man Singh carries the Guru on his back. The Mughal army still pursues them, trying to find where they have hidden. The Guru and his men arrive in a village in the jungle. A man named Gulaba gives shelter to the Guru. While in Gulaba’s house, a Sikh woman comes to the Guru. She had previously seen him and vowed to spin and weave cloth for him, which she presents. The Guru has the cloth dyed blue and made into a robe, so he can imitate a Muslim Pir. Two Muslims who had previously known and visited the Guru come and offer their services. When they leave Gulaba’s village, the Guru is on a manji, carried by four people with a fifth person waving a chauri above his head. The four are Ghani Khan, and Nabi Khan (in front); Bhai Dharam Singh and Bhai Man Singh in the back, and Bhai Daya Singh waving a chauri. They proceed from the forest like this – claiming that the person they are carrying is a high Muslim priest ‘Uch Da Pir’. Guru Gobind Singh and his group eventually arrive at Jatpura. There, the Guru sends a servant to Sarhind to inquire about the fate of his mother and sons. Jatpura is 50 miles/80 km away from Sarhind. He stays at Jatpura, waiting for the servant to return with the news. This is where Guru Gobind Singh learns about the death of his mother and two youngest sons Baba Zorawar Singh and Baba Fateh Singh. This is where he vows to uproot the Mughals, and lay waste to Sarhind. After Jatpura, Guru Gobind Singh arrives at Dina. There, he composes the Zafarnama to Aurangzeb. Bhai Daya Singh and Bhai Dharam Singh are dispatched to deliver the letter to Aurangzeb. Guru Gobind Singh arrives at Dhilwan. At Dhilwan, a Sikh presents the Guru with a suit of clothes. The Guru removes and burns the blue robe Muslim Pir disguise. He saves a piece of the cloth to remember his hardships and journey, and proclaims that the Mughals will be destroyed completely. There are more stops, more stories, before the actual battle at Khidrana (Sri Mukatsar Sahib.) These stories listed are highlights of where Guru Gobind Singh traveled and what happened in those places. When we look at this odyssey of Guru Gobind Singh, it is easy to see that it would have taken many weeks – perhaps months – for him to arrive in the forests around Khidrana after the fall of Anandpur Sahib. In this way, the timing makes no sense if we say that the 40 left Anandpur Sahib, went to Jhabal, and then, under Mai Bhago’s leadership, turned around and arrived at Khidrana, ready to fight. There is too much that happens before this battle for the process to be so straight-forward. In addition, how would Mai Bhago and the 40 know where to go? How did they end up at Khidrana? As we asked ourselves these questions, we found a reasonable alternative version of the story in The Sikh Religion by Max Aurthur Macauliffe. Macauliffe is one of the earliest Sikh historians who wrote in English. The value of his work is that he recorded the stories of the Sikhs who lived in Punjab during the late 1800’s. Here is what the voices from those times told Macauliffe. It was not only forty people who deserted Guru Gobind Singh at Anandpur Sahib. MOST of the Sikhs abandoned the Guru. We don’t know the exact number but it could have been hundreds who signed letters of renunciation. In fact, Macauliffe states that only 40 Sikhs stayed true to Guru Gobind Singh at Anandpur Sahib. “After much reflection and hesitation, however, the Sikhs changed their minds and said, ‘It is better for us to break with him, and write a document to the effect that he is no more our Guru and we are no more his Sikhs. If we again meet him alive, we shall induce him to pardon us’…..
“On seeing the Guru’s mother take her departure, the Sikhs began to waver in their allegiance to the Guru. Paper, pens and ink were produced for those who wished to write letters of renunciation and in the end only forty Sikhs decided to remain with the religious Chief and share his fortunes.” – The Sikh Religion by Max Arthur Macauliffe. Volume 5. Page 183-184. So then where do the Forty Liberated Ones come from? Macauliffe talked about the 40 Sikhs who fought in Khidrana, but he tells a very different version of the story. In The Sikh Religion, these “Manjha” Sikhs feel bad about abandoning the Guru at Anandpur Sahib, after they hear of all the intense difficulties the Guru and his family suffer. So they decide to find him and convince him to surrender to the Emperor. “All the contests and suffering of the Guru became known in the Manjha, and the Sikhs who dwelt there censured themselves for having listened to Duni Chand and abandoned the Guru at Anandpur. They now began to consider how they could make reparation and assist their spiritual master in his dire extremity. They were, however, of the opinion…that the Guru should adopt the way of Baba Nanak and cease all hostilities. They sent a large deputation to press their advice on him, and promised that, if he accepted it, they would use their influence with the Emperor to pardon him. Otherwise, they would not consider themselves his Sikhs or him their Guru…. The deputation of the Manjha Sikhs found the Guru after much search. On hearing their representation, he said, ‘If you were my Sikhs, you would receive and not give me instruction. I do not require you. You deserted me formerly. Who hath sent for you now? You have come to adjust my quarrels, but where were you when I needed your assistance? You used no influence with the Emperor when Guru Arjan was tortured to death or when Guru Teg Bahadur was beheaded. On this account, my brethren, I cannot listen to your advice. When I am again in difficulty, you will betray me as before. Put on record that you renounce me and go to your home.’ Upon this, the deputation drew up a formal document to the effect that they renounced the Guru unless he ceased to contend with the Turks…. Five of the Manjha Sikhs repented of their renunciation of the Guru, and decided to return and render him all assistance. They induced thirty-five more of their number to return with them. The Guru thus obtained an unexpected reinforcement of forty good and earnest fighting men. They were joined by a heroine named Bhago who through zeal for the Sikh cause had donned man’s attire and vowed to suffer death if necessary on the bloodstained field on behalf of the Guru.” – The Sikh Religion by Max Arthur Macauliffe. Volume 5. Page 210-212. Although Macauliffe does not discuss the role Mai Bhago played in causing the 40 to return to fight, this version of the story really helps answer the key questions of timing and how Mai Bhago and the 40 knew where to go. If hundreds deserted the Guru at Anandpur Sahib, and these 40 are among them, then they have time to return to Jhabal, and recover their strength while Guru Gobind Singh embarks on his dark and difficult odyssey. Then, when the 40 renounce and sign a letter after finding the Guru in a village near Khidrana, the timing works much better. Mai Bhago immediately rallies the 40 to return to the fight. And having just met with Guru Gobind Singh, they know exactly where to go (The forest outside of Khidrana: present day Mukatsar). 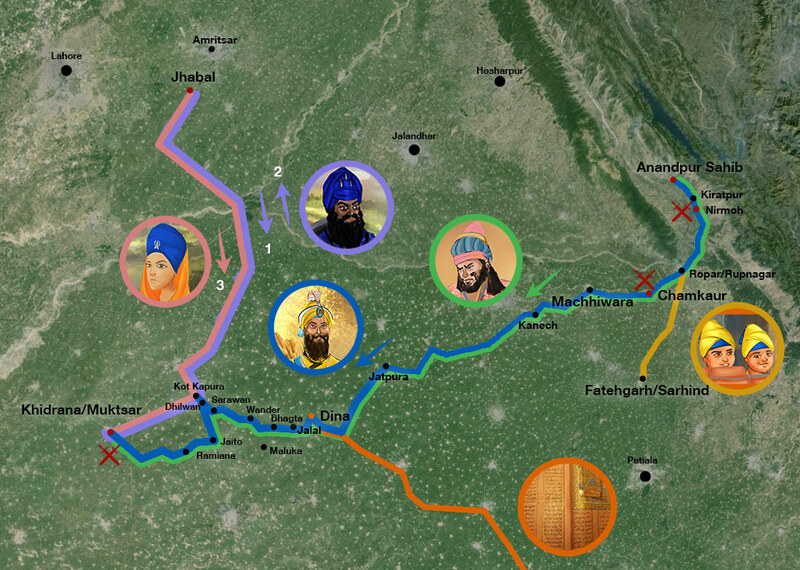 The version of the story recorded in The Sikh Religion matches the map of their respective journeys much better. This is why, in the animation KAUR, Saibhang Kaur’s grandmother tells the story from this perspective. Why is it so important to try to get these details right? During our research, what I personally realized is that Mai Bhago did far more than lead forty men back into battle to regain their honor. The Battle of Mukatsar is THE moment when the Mughal’s relentless pursuit of Guru Gobind Singh ends once and for all. If we do not understand the incredibly painful odyssey that the Guru underwent after the fall of Anandpur Sahib, if we do not give ourselves the eyes to see the depth of the journey he took, then we will never understand the crucial importance of Mai Bhago’s decision to lead these men into battle. Energetically, she turned the tide in favor of the Guru, even though so much had been lost. After the Battle of Mukatsar, Guru Gobind Singh ji could proceed relatively unmolested to Nanded, where he established one final center before leaving his physical body. Sikhi as practiced today is the direct result of Guru Gobind Singh’s last instructions at Nanded (Abchal Nagar). Mai Bhago’s heroism helped the Guru in his time of need. In that moment, she not only supported these 40 men in regaining their honor and becoming liberated. She protected the future of the entire Sikh community, as well. When it comes to Sikh history, these old stories are a starting point. We understand there may be resources or research about Mai Bhago and the Forty Liberated Ones that our creative team could not access. We know other people may come forward with more information, or different perspectives. We do not claim this to be the final, definitive version of Mai Bhago and the Forty Liberated Ones. However, it was important to us that we did what research we could. These are our results. We hope you enjoy the story of Mai Bhago in SikhNet’s animation KAUR. Please forgive any errors in the retelling of the story. It was our deepest blessing to do this project. Ek Ong Kaar Kaur Khalsa. Program Director, SikhNet.com.